For the second week in a row, Tom Brady was down at home to a team that New England was favored to beat. And for the second week in a row, a comeback seemed inevitable, especially when Brady converted a late fourth-and-goal to tie the game. But this wasn’t a day for Tom Brady to once again show his dominance. Instead, Cam Newton reminded us today how amazing he can be. Coming off a three-interception game last week against the Saints, and facing questions about his health, Newton had what may have been his best game in over a year, going 22-for-29 for 316 yards passing, plus 44 yards rushing and four total touchdowns. 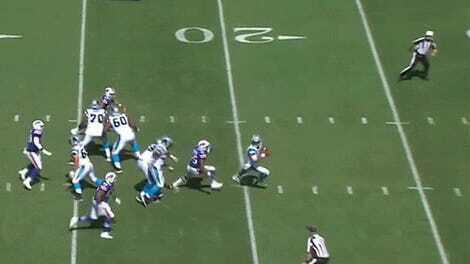 His play put the Panthers up 30-16 in the fourth quarter, and even though Brady came back, Newton and the Panthers answered, as Graham Gano hit a game-winning 48-yard field goal as time expired. Newton was feeling himself this afternoon, showing signs that he could still be the thrilling, talented, Cam who took over the NFL back in 2015. 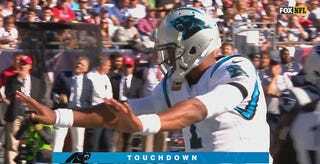 You could see Newton’s returned confidence most on his rushing touchdown, which he capped off by throwing up a fist. With the Falcons home loss to Buffalo today, the Panthers are now tied with Atlanta at 3-1 for the division lead. If fun, healthy Cam Newton is truly back, this is going to be an exciting year for Carolina.